Mark your calendars folks. 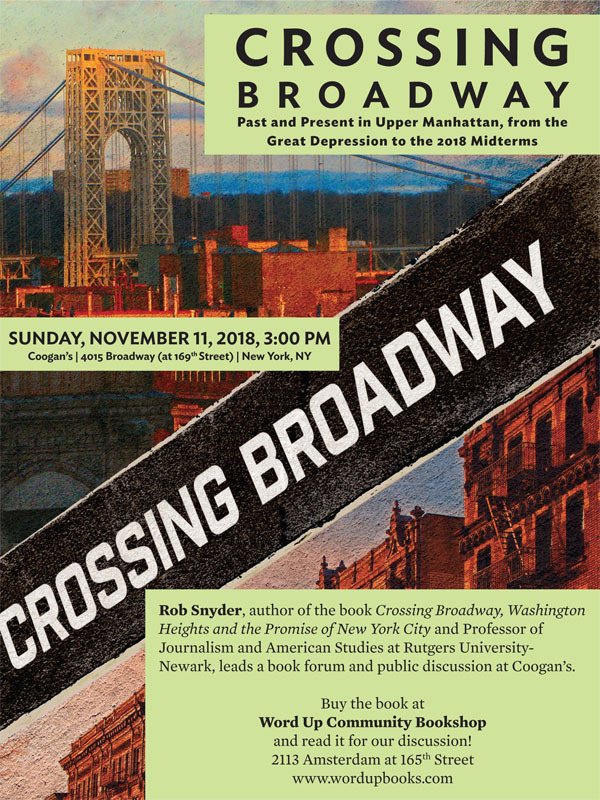 All roads lead to Coogan’s (4015 Broadway @ 169th Street) on Sunday, November 11 at 3 pm for a book forum and public discussion led by the erudite and engaging Robert W. Snyder. Mr. Snyder is the author of the official history book of Washington Heights, Crossing Broadway: Washington Heights and the Promise of New York City. So this is what you have to do. If you have not read the book, hit up Word Up Books (2113 Amsterdam Ave @ 165th Street) and purchase this indispensable addition to your Uptown library and make sure you are there for the book forum at Coogan’s. This is an event you don’t want to miss. See you there!